The way that oil and gas fracking is practiced in the US is dangerous to public health exposing people living around wells to respiratory infections, cancer and a reduction in brain activity, David O. Carpenter, environmental health expert, told RT. Scientists have discovered dangerously high level of cancer-causing chemicals in the air around fracking wells in five different states in the US. A report revealed that levels of benzene, hydrogen sulfide and formaldehyde were many times above American air pollution limits and were detected within residential areas near to fracking sites. RT spoke with David O. Carpenter, author of the study to find out how dangerous fracking is for health. David Carpenter: I don’t think fracking has to be dangerous to our health but fracking in the way it’s practiced right now in the US - at least in these five states - is extraordinary dangerous. We focused a lot in our report on two chemicals that cause cancer – benzene and formaldehyde - and their levels were sky high, much higher than it is regulated in other industries. They are both known human carcinogens, according to the World Health Organization. They should not be released in this fashion. It isn’t that the fracking per say is something that is necessarily dangerous but clearly there is a release of all of these organic chemicals, including these carcinogens, benzene is released, formaldehyde is formed. That’s just not acceptable because these [chemicals] are very dangerous for public health. RT:Why are they still doing it then? DC: I think it’s because they are careless. There are leaks in the system. That’s not for the benefit of the industry either because they want to capture this natural gas and sell it. One of the problems in the US is our Congress because they wanted to promote energy self-sufficiency, and has exempted oil and gas industry from most of our federal regulations. No other industry would be allowed to release benzene, formaldehyde in these concentrations. It is contrary to the Clean Air Act. 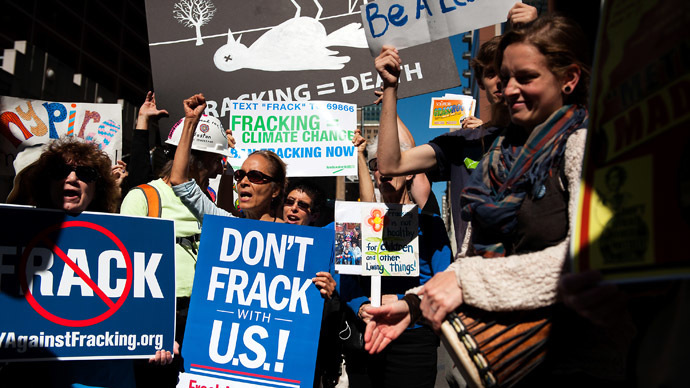 RT:How much do you hope your study will break ground in terms of convincing governments of the perils of fracking? DC: I think that our study alone won’t accomplish that. But I hope that it helps moving in that direction. We are caught in this bind between the benefits of something that helps the economy and the risk to human health. That’s always a debate and politicians are usually more interested in short-term benefits than long-term risks. Cancer isn’t going to occur tomorrow, it is going to occur 10-20-30 years from now in people that are exposed to those dangerous contaminants. What we are seeing right now are respiratory infections and nose bleeds. Think about formaldehyde, that’s basically an embalming fluid, if you breathe it in 24 hours a day – and are samples from formaldehyde were taken over eight-hour periods – you are going to pickle epithelium in your nose. Many of the people living around these sites have nose bleeds. Is it surprising? Not at all. RT:Isn’t it surprising that government isn’t listening to you? DC: There hasn’t been much evidence like this and again, that’s one of the problems because the federal government doesn’t support much research in that area. The health agencies have been intimidated because the US Congress exempted the industry from regulation. So they have shied away from founding research. I do hope that our study and others that are being done demonstrating health risk in these communities will tighten up the regulation. I’m not just philosophically opposed to fracking, I would certainly rather have renewable energy – wind and solar and so on. We are a long way from meeting those needs. Natural gas is a healthier fuel even than oil, but to take natural gas from the ground in a way that exposes people living near those wells to cancer, respiratory infections… I didn’t mention but these chemical also act on the brain, they reduce mental functioning. And this is simply not correct; it’s not acceptable and should be stopped.